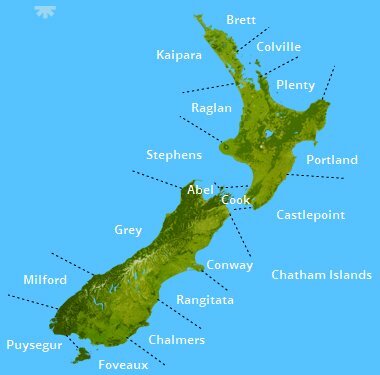 The coastal weather zones in New Zealand have names like "Abel", "Tasman", "Conway", "Grey", etc. It is quite difficult to get a description of what these weather zones are and where their borders are. A call to one of the Marine Radio operators on VHF 16 will usually be able to resolve which weather zone you are currently in, but the weather forecasts for the weather zones on VHF don't specify the parameters of those weather zones (unlike, for example, in Australia, where the weather forecast will be preceded by a description like "Hunter Coast, between Broken Bay and Seal Rocks and 60nm seawards, points which can be found on the standard charts). In general, I have found that NZ weather forecasts as issued by the NZ Met Service are highly unreliable. The level of unreliability increases the further south you go. Cruisers who are used to hearing a weather forecast in other parts of the world and making assumptions about the accuracy of the forecast wind speed or direction will need to reset their expectations on enteirng NZ waters. In particular the weather in many parts of NZ is highly changeable during the course of a day, and the NZ met service make no attempt to take this into account -- their forecasts are usually only indicative of the approximate average wind strengths during the day, and a rough guide to which direction the wind may be coming from at some time in the day (although on 3 out of 5 occasions I have listened to recently and experienced the conditions, the forecast wind direction was not correct for any part of the day). Russell Radio - for frequency and schedules, check out their website. "Taupo Maritime Radio" maintains a continuous watch on 2182kHz, 8291kHz, 4125kHz, 6215kHz and 16420kHz. You can also contact them by phone: Ph: +64 9 359 6655 or +64 25 961 375 (after hours). A phone report may also be made to MAF in Auckland, Tel. +64 9 366 0345, +64 9 309 9093 or +64 274 975 171 (after hours). "Russell Radio" will inform Customs and Immigration of your arrival by request. You'll find that for the most part Kiwi's are friendly and helpful. And whilst most locals are honest there is a criminal minority. So take the same care of yourself, boat and your belongings as you would anywhere. Be especially careful to avoid having to walk anywhere late at night, even in small towns. Most NZ Police Offcers are not armed. Several air lines service international routes from/to New Zealand. Whilst the majority of flights arrive/depart Auckland, wellington, Christhcurch and Queenstown also have international airports.